#36: Enough With The Seinfeld, Already! Maybe you faithfully sat in front of the TV every Thursday night (remember those pre-TiVo days?) for Seinfeld‘s entire first run. Maybe you still catch the syndicated shows nearly every night, just like your parents watch The Nightly News and your kids watch The Simpsons. Maybe you’ve gotten the boxed sets as gifts for every occasion over the past few years. And maybe you can genuinely relate nearly everything that happens in your life to a Seinfeld episode. But listen, the real-life Jerry has moved on. He’s got a young wife, little kids, a struggling new career as a voice-over actor: When you’ve got that much money, you can buy yourself a twenty-years-younger life. Larry David has moved on with his new family, the Blacks. 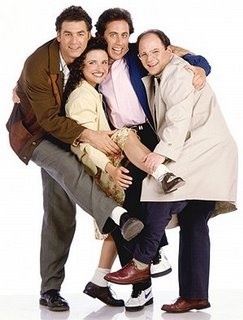 All the other Seinfeld players have moved on, with shows and futures of their own. OK, most of them. Before you move on, too, though, I want you to know that the Pam, Pam, Pam episode — aka The Soul Mate, written by Peter Mehlman — is about me, me, me.